This is a fabulous series by an even more fabulous author! …or to be more accurate, G. Lestrade the next-next-next-next-next generation. 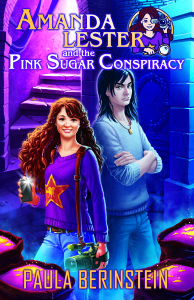 Amanda Lester, the twelve-year-old protagonist of my book Amanda Lester and the Pink Sugar Conspiracy, is descended from Inspector Lestrade and couldn’t be more embarrassed. The man was a twit and everyone except her parents knows it. They think Lestrade is the bee’s knees and want their daughter to follow in his footsteps, but she wouldn’t be caught dead being a detective. She is a filmmaker extraordinaire. So when they send her to a secret school for the descendants of famous detectives in the English Lake District, it’s no wonder she freaks out. There comes a point in every child’s life when they have a very startling reality revealed. It has nothing to do with where babies come from, either. It’s the harsh truth that – as much as it pains me to say this – I am not perfect. Cole made it almost 11 years before the illusion he had of me, his mother, being perfect and flawless was shattered. Realizing Mama is not perfect is more devastating than other truths we find out in childhood. I remember the day I realized my own Mama wasn’t. I was only four, but it was life changing nonetheless. Granny was far from perfect but she considered herself a limited edition, so her flaws were part of what made her unique. That, and she’d just as soon slap you silly if you told her otherwise. But my son thought I hung the moon and the stars and was right about everything. If I said it, it was gospel. He believed what I told him – he knew I wouldn’t lie to him and if he heard me utter anything to his daddy, he took it as truth. Mama could tell him something and he would tell me he wasn’t so sure. She may not be far off on the cat. Since the first time I realized Mama was not perfect, I have learned to accept that sometimes, Mama was wrong. Sure, she was right about somethings – the ex, for one – but some things she was horribly wrong about. Like that Lancome powder she keeps trying to give me that makes you all shimmery. No one, unless you’re an extra in a show with vampires, needs to shimmer that much. Just like she was wrong in the ‘80s when she wore parachute pants with high heels. So while I love my Mama, I am very aware that she is not perfect. My child, however, was still living in the fairy tale of me being perfect. As long as I was instilling fear into the elementary crowd and avoiding impending explosions, I was doing my job. And, they believed me. I was still perfect. I was still right. Being right was kind of my thing with Cole. I told him if he touched the gas heater, he would get burned. I cautioned him on various and sundry other things, all ending with me being right. “How do you always know what is going to happen?” Cole asked after another brilliant example of my omnipotence. Oh, oh, oh, how those words can come up and bite you in the tater when you least expect them or want them to. We were out running errands when we decided we needed to run through a drive thru for ice cream. I was happy to see coupons for free ice cream in the dash. And Lamar gets on to me about not cleaning out my trash when I exit the van – I just saved a few bucks by being lazy. See how right I was? I gave our order and told the clerk we had coupons for the ice cream but not the smoothie. When she gave the total, it was a lot more than just a smoothie. “Maybe Daddy got a bigger smoothie?” Cole suggested. “No,” I said. “I think they are overcharging us. They overcharge you in the drive thru.” The scene from the “Lethal Weapon” movie with Joe Pesci played through my head. “Leo Getz was right,” I muttered. “Oh, no, it wasn’t,” I said convinced. How dare this child attempt to reason with me. Lamar drew a sharp intake of air. My child didn’t miss a beat. Where do you think he gets his dogged stubbornness and relentlessness from? I turned around in my seat and looked at my precious monkey in the back of the van. I don’t want to get into specifics. It was not only an honest mistake, but, the young lady told us she’d see us Sunday at church. I felt like a heel. “How’s your ice cream?” Lamar asked. The little stinker was right. And we all knew it. Sour lessons and sweet victory.